Synthetic peptide conjugated to KLH derived from within residues 400 to the C-terminus of Mouse Sp7/ Osterix. 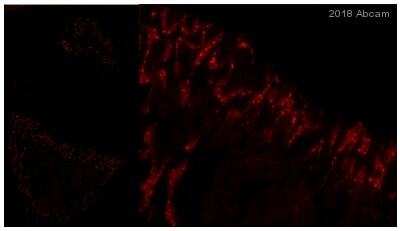 This antibody gave a positive signal for Immunohistochemistry (FFPE) in Rat bone. Our Abpromise guarantee covers the use of ab22552 in the following tested applications. IHC-P 1/100 - 1/500. Antigen retrieval is not essential but may optimise staining. Transcriptional activator essential for osteoblast differentiation. Binds to SP1 and EKLF consensus sequences and to other G/C-rich sequences. 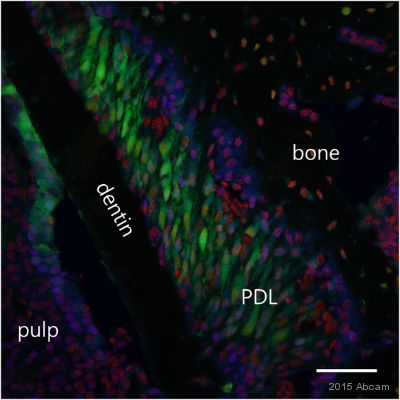 ab22552 staining Osterix in rat femur sections by Immunohistochemistry (Formalin/PFA-fixed paraffin-embedded sections). Tissue was perfusion fixed with 4% PFA in 0.1M phosphate buffer (pH 7.4) via the left ventricle and decalcified in 10% EDTA. Samples were incubated with primary antibody (1/2000) for 12 hours at 4°C. 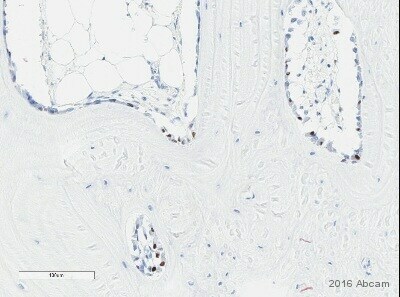 Histofine simple stain rat MAX PO was used as the secondary antibody. Immunocytochemistry/ Immunofluorescence - Anti-Sp7 / Osterix antibody - ChIP Grade (ab22552)Image from Ortuño MJ et al, J Biol Chem. 2010 Oct 15;285(42):31985-94. Epub 2010 Aug 3, Fig 1.
ab22552 staining Sp7/ Osterix in C2C12 cells by Immunocytochemistry/ Immunofluorescence. Cells were stained with ab22552 at a 1/500 dilution followed by goat anti-rabbit IgG conjugated with Alexa Fluor 488 at a 1/400 dilution. Labeling was detected using a Leica TCS SL inverted laser scanning confocal microscope. The subcellular localization of Osterx in C2C12 cells was analyzed by immunofluorescence with ab22552 in cells either transiently transfected with short Osterix construct or incubated in medium without serum. Scale bar 10 µm. Immunohistochemistry (Formalin/PFA-fixed paraffin-embedded sections) - Anti-Sp7 / Osterix antibody - ChIP Grade (ab22552)This image is courtesy of Jérôme AMIAUD, Laboratoire de Physiopathologie de la Résorption Osseuse et Thérapie des Tumeurs Osseuses Primitives. We thank them for their important contribution to the validation of ab22552. Immunohistochemical analysis of paraffin embedded mouse osteosarcoma tissue labeling Sp7/Osterix with ab22552 at 1/1000 (overnight at 4°C). Fixed 48h in 4% formol. Decalcified in 4% EDTA and 0.2% PFA pH7.4 before inclusion in paraffin. Biotin conjugated secondary 1h RT. Amplification StreptABC, substrate DAB. ab22552 staining Osterix in Human bone marrow tissue sections by Immunohistochemistry (IHC-P - paraformaldehyde-fixed, paraffin-embedded sections). Tissue was fixed with 10% NBF and blocked with Serum Free Protein Block (Dako) for 5 minutes at 24°C; antigen retrieval was by heat mediation in a citrate buffer. Samples were incubated with primary antibody (1/1000) for 30 minutes at 24°C. An undiluted HRP-conjugated Goat anti-rabbit polyclonal was used as the secondary antibody. 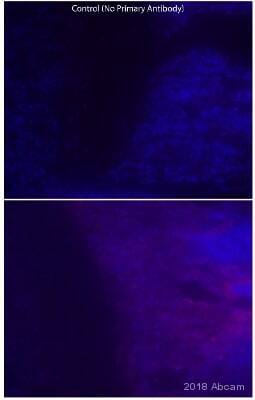 ab22552 staining Sp7 / osterix in human bone marrow tissue. Paraffin embedded human bone marrow tissue was incubated with ab22552 (1/25 dilution) for 30 mins at room temperature. Antigen retrieval was performed by heat induction in citrate buffer pH 6. 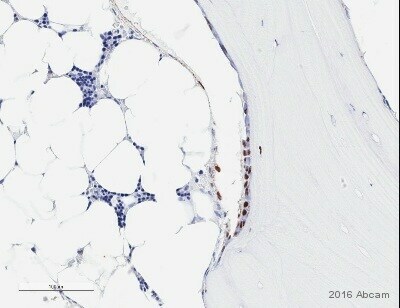 The image shows Osterix staining in rat bone tibiae using ab22552 at 1/100. 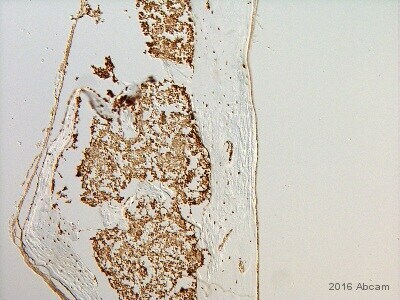 ab22552 staining Sp7 / Osterix in 21 days old rat developing long bone tissue section by Immunohistochemistry (Frozen sections). Tissue samples were fixed with methanol and blocking with 20% serum at 220C for 30 minutes was performed. The sample was incubated with primary antibody (1/100) for 3 hours at 220C. A Cy3®-conjugated Goat polyclonal to rabbit IgG was used as secondary antibody at 1/1000 dilution.